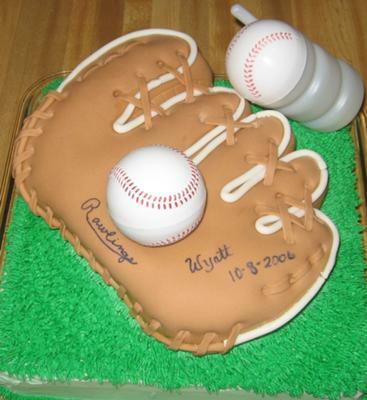 To make this baseball mitt cake, I baked a 1-layer 10" round pound cake and 1-9" loaf. For the thumb, I placed the 9" loaf on its side and to one side of the 10" round. (Place the loaf to the left, for left-handed catcher, to the right for right-handed catcher). I then carved to the shape of a baseball mitt. I put on a light coat of buttercream and then covered in light brown fondant. I outlined the finger area with white fondant expressed throught a craft gun. I then made laces from same light brown fondant that covered the glove. I wrote with a non-toxic black marker the "manufacturers" name and the birthday boys name and date of his current birthday. The baseball and sports bottle were purchased. I have since made this cake again and I made the baseball using pieces left over from the carving. Just roll them into a ball and cover with fondant and pipe on the red lines. I loved the laces too!!!! Join in and write your own page! It's easy to do. How? Simply click here to return to Baseball Cake.